From as far back as I can remember, I have had a connection to the canine animal world. Raised in the mountains of Spain, I played among our family ́s pack of powerful Spain Mastine sheepdogs. Respect for mother nature and the responsibility we have to it was a mainstay in the elders who taught me how to live amongst the canine part of our family. Although I was brought up in this environment, the path that took me to move to the US was completely different. I studied philosophy at UNED in Madrid before I was granted a scholarship to compose and perform music at Berklee College of Music from where I graduated. After arriving in NYC and successfully pursuing a Jazz career for several years, I injured my left hand and had to stop performing. This was devastating. Watching me struggle, my wife Katie, decided to get a dog for us. I was soon inspired by our new puppy, Ralphie, who challenged me by not behaving! I threw myself into working with Ralphie on his behavior and became inspired by my new little pal to start a dog walking and training career. I then discovered my innate ability to help dogs behavior by simply walking them correctly. I spent a good amount of time and energy making sure that all dogs were properly walked and especially good on the leash while walking. 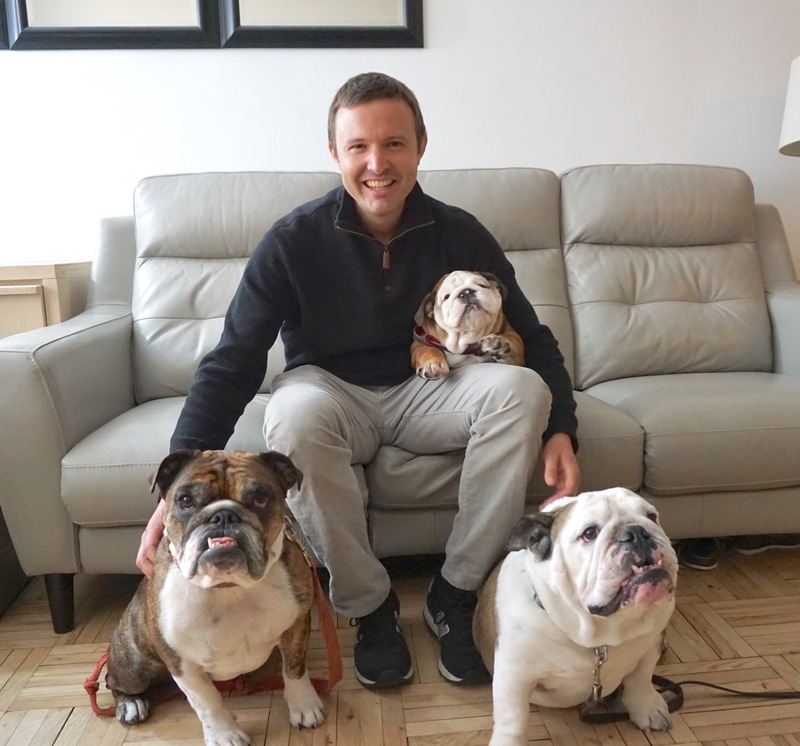 I became the ̈Go To ̈ dog trainer in NYC and started noticing how a lot of dog training clients were complaining that their dog walkers were undoing all their training. They really didn’t have the knowledge of walking dogs correctly. The business started blooming and I soon realized the great opportunity I had in my hands to share this vision and knowledge. This is where it all started. I started walking dogs in the city and eventually training my own team of dog walkers creating Pawmos! From the Spanish word vamos!, which means let’s do it! Arin is a Sound Engineer professional who loves animals in general and dogs in particular. He loves outdoors activities and thought that walking dogs during the day would be the perfect fit for his evening/night shifts as an engineer. He was born and raised in Turkey and at some point in his life he decided to move with his wife to NYC and join the music and dog community!! Before Dany joined Pawmos he already had 6 years of experience handling dogs and training them with basic obedience at a doggy day care. His goal is to become a Veterinarian at some point. Meanwhile he wants to be surrounded and working with dogs as much as he can. His true passion and expertise it’s been a great asset to Pawmos. In his free time he enjoys playing and coaching baseball to kids. Nicholas is a lifelong animal lover. He now lives in Brooklyn, but while growing up in Massachusetts he was always around dogs. He is an experienced dog walker and aims to eventually become a dog trainer. Steven has several years of experience handling dogs at a doggy day care. He has and innate talent to communicate and handle dogs as well as true passion, love and respect for animals. He loves outdoors activities and thought that walking dogs during the day would be the perfect fit for him. Mariana has always surrounded herself among animals growing up.While growing up at her granmother´s she was always around dogs She is very family oriented and the oldest of all her cousins and because of that she learned to be very patient and responsible with both younger humans and dogs. She studied Liberal Arts and loves outdoors activities. Kristal has an innate ability to communicate with dogs. She loves outdoors activities as well as sports. One of her favorite hobbies is dancing salsa. Kristal worked at modell’s sporting goods where she learned to be very patient, responsible and very good communication skills , all of which she leveraged into dog walking. She’s planning to study mechanical engineering. Natalie has always been devoted to animals for as long as she can remember. When she was a kid she decided to get her own pets and learned just how much love and care they needed. She was always ready to help lost dogs to return to their home. She enjoys being out in any type of weather and outdoor activities. Natalie has an innate talent to communicate with dogs and is always willing to walk the extra mile to help and take care of any animal.